How much does it cost to travel to Nadi (Port Denarau)? How much money will you need in Nadi (Port Denarau)? FJ$298 ($140) is the average daily price for traveling in Nadi (Port Denarau). The average price of food for one day is FJ$71 ($33). The average price of a hotel for a couple is FJ$374 ($175). Additional pricing is in the table below. These average travel prices have been collected from other travelers to help you plan your own travel budget. How expensive is Nadi (Port Denarau)? Nadi, pronounced "Nandi", is a city and transportation hub in the Fijian islands. It is on one of the main islands, Viti Levu, and has a population of about 42,000. Many inhabitants are Indian as well as Fijian, and the largest temple in the Southern hemisphere is located in the city center. It must be noted that Nadi and surrounding areas aren't known for the beaches. This is more of a cultural destination or starting point for your trip to Fiji. For the best beaches, you will want to venture out to the other, smaller, islands. The Sri Siva Subramaniya Swami Temple is located in Nadi and is a traditional Hindu temple that has Dravidian style architecture that you can usually only find in India. It was designed by artists from India and is dressed with wooden carvings from there as well. Be sure to dress respectfully when visiting the temple. The Garden of the Sleeping Giant is a beautiful garden in Nadi with multiple different orchids and cattleya hybrids. You can walk beneath the canopy on the outskirts of the jungle and see peaceful lily ponds as you stroll. This garden is about five kilometers from the Nadi Airport. Visit the village of Viseisei, about ten kilometers from Nadi Airport. It is believed that this village is the oldest in the country, where the Fijian ancestors first settled. The village has a local craft center and a church that commemorates the arrival of missionaries. 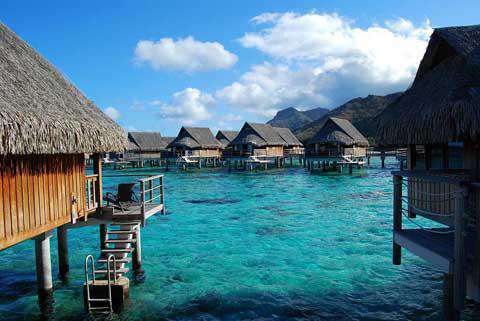 Nadi is located on the main island of Fiji, which is called Viti Levu. This is where you will have to start your holiday in Fiji if you are traveling there by air. Located on the western side, Nadi is just one of the regions of the main island and it is also where the airport is located. There is a hostel near the airport called Smugglers Cove that is very affordable with the loveliest staff. Suva is another region on the eastern side of the main island and is the capital of Fiji. Here you can find the Fiji Museum, the Municipal Market with a wide variety of fruits and vegetables, and the Suva City library, which is a grand British colonial building. Lautoka is north of Nadi and is the second largest city in Fiji. This city has a history of fortunes in sugar but is not usually visited by travelers. However, there are many cafes and it sits at the base of Mt. Koroyanitu. Zip line at the Garden of the Sleeping Giant! The course has ten lines that go on for about a kilometer through the Fijian tropical rain forest. The longest line is almost 160 meters. This is a thrilling and scenic activity in Nadi. Visit the Fiji Museum in Suva, the capital city of Fiji. The museum is located within the botanical gardens and has an archeological collection that is almost 4,000 years old. It captures the essence of the indigenous cultural and history of Fiji. There are many markets in or around Nadi with produce and traditional Fijian craft. The Nadi Produce Market and the Nadi Handicraft Market are worth visiting. Fiji has very flavorsome traditional cuisine. A couple of Fijian dishes/foods are Kokoda, which is similar to ceviche, Lovo, which is a meal that is cooked in the ground and is a ceremonial type meal. Another is Duruka, which is a Fijian vegetable similar to asparagus. Taro is another Fijian vegetable that is very similar to a potato with a purple root. Nama is a delicious Fijian delicacy that is locally known as sea grapes. These "grapes" are found in shallow waters and can be used in salads or soups. You will have to try Kava in Fiji, which is a type of drink. It is made from a sun-dried kava root that is pounded into a fine powder and mixed with cold water. Although it is not alcohol based, it is meant to leave you feeling a bit loopy after having a few of these. There are many authentic Fijian and Indian restaurants in Nadi. Tu's Place is a great place where you can find authentic Fijian food at great prices. Blue Bure is another restaurant in Nadi (also a hotel) and is very affordable. This restaurant is actually known for its Italian food but comes with a Fijian touch. The chefs use their local and traditional produce when preparing the meals to give it that Fijian zing. To get to Nadi, you will most likely have to come by plane (unless you plan on sailing). Nadi is the transportation hub of Fiji so it is usually most travelers' first stop on their holiday in Fiji. Once in Nadi, taxis are probably your best bet for getting around the city. There is a bus system on the island but is usually extremely packed so be sure to get to your stop early. This can be pretty uncomfortable in the Fijian heat. You can also find passenger vans that travel between Nadi and Suva, they can be found on the main streets of each city. This option is slightly more expensive than the bus system. Swimming with manta rays is a once in a lifetime experience and Fiji is one of the few places in the world where you can experience this. They truly are graceful and beautiful creatures. Timing can be tricky, and it's hit or miss whether you actually will get to see them, but if you do, you'll never forget it. Manta rays are the largest rays in the world and their size makes them that much more mesmerizing. Whether you're diving or snorkeling, this is an experience you have to have.